William Jackson didn’t come to Bradford until he was in his mid-thirties, but through his own efforts and exceptional musical talents he soon became a well-loved and respected resident of the town. His untimely death, aged just 51, sent a shockwave through Bradford. So who was this man? 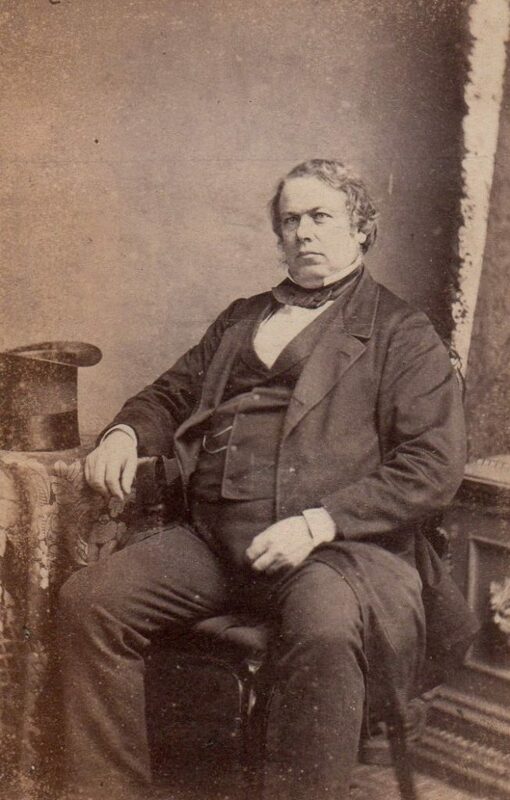 William Jackson was born in Masham on 9 April 1815. His parents were, John, a farmer/miller and Sarah. He had an older brother, also called John and a sister, Catharine. By the time he was 8 years old in 1823, William Jackson had already developed a passion for music. According to newspaper reports (his obituary) he was by this time living with his grandmother at Tanfield Mill. It was here that he learned to play an old fife which had belonged to his father and then a 4-keyed flute given to him by a neighbour. Recognising that he wasn’t making much progress with book-learning, his parents sent him off to school in Pateley Bridge – where he sought out more musical companions, a group of village singers, who taught him to read music. He was soon more proficient at reading music than books and returned to his Masham home full of musical notions. One of the Masham parish clerks had bought a cheap old barrel organ (the old hurdy-gurdy type) with the ambition to restore it to working order again, but despite his efforts could only make it ‘scream, grunt or groan’. Hearing that William might be able to help, the parish clerk took the barrel organ to William’s home. Promising to have it up and running in a week, William set to work. He was as good as his word and the old clerk was moved to tears by the old tunes the organ could now play. William was paid a gold sovereign for his work (a considerable sum in those days especially for such a young boy). Buoyed by success, William fancied he might be able to make a barrel organ, so he and his father set to work. Neither was skilled in woodwork but through a great deal of trial and error eventually they succeeded and within 4 months they had an instrument that would play 10 tunes. It was the wonder of the neighbourhood & people not only flocked from far and wide to hear it but sent their barrel organs to the Jacksons for repair. William next set his sights on making a 5-stop finger organ, something he yearned to possess but couldn’t afford to buy. His brother bought him a set of keys from an old harpsichord and before long William had constructed an organ. He didn’t know how to play it properly though, so taught himself, begged some loose sheet cathedral music and practised daily – in his work breaks and in the evening. By this time William was working full-time as a miller and also in the fields during the summer. Furthering his passion for music, William turned his talents to composing and a friend of his took a dozen anthems he’d composed to show the York Minster organist who was astonished at the ability of the 14-year-old miller’s son and encouraged him to continue composing. William started writing tunes for the newly formed Masham Military Band, and also learned to play each instrument – not to a professional standard –, which later helped him when he started arranging and composing orchestral music. Still working as a miller and freelancing as a musician, William’s horizons expanded in 1832 when the lord of the manor at Masham presented the parish church with a finger organ and William was appointed organist at a salary of £30 a year. Of course this was still only a small job, so having served his apprenticeship as a miller, William continued as a journeyman on a weekly wage of 3s 6d. He was 17. His music studies continued, he pored over full scores of music by Mozart, Haydn & Mendelssohn (who would have been a modern composer at that time!) and he began to take a few pupils. Teaching didn’t suit him – the pupils didn’t have much aptitude and wouldn’t practise – so he gave up in despair. According to his obituary in the Bradford Observer he went into business as a tallow chandler in 1839 and continued that business for 13 years until he came to Bradford. However, the 1841 census shows William aged 26 living with his parents and sister in West Tanfield nr Masham and his occupation is described as an organist. Is this because he identified himself as a musician first and foremost? Certainly he was gaining a wide reputation as a composer, with his glee ‘The Sisters of the Sea’ gaining first prize in the Huddersfield Glee Club, contest in 1840 and in 1841 he was commissioned by the reasonably recently formed Huddersfield Choral Society to compose music for the 103rd Psalm for choir & orchestra (possibly for the Choral’s 5th anniversary). On 27 July 1842, William married Mary Coultman in Wensley. She was a publican’s daughter & lived in Wensley High St. Their first child, Sarah, was born the following year, and a brother, Charles, followed in the spring of 1845. Meanwhile, the family continued to grow with the birth of Marian & Margaret in 1846 and Fanny in 1851. Another oratorio, ‘Isaiah’, was published in 1851 and William Jackson’s literary abilities must have improved from childhood as he contributed a series of articles, ‘Rambles in Yorkshire’, to a local paper. Whether he was approached through his musical connections to go into business in Bradford it’s not clear, but in May 1852 William Jackson was finally able to turn his ‘hobby’ into his profession. He entered into partnership with a Mr Winn, as a music-seller, taking over the business of Messrs. Hopkinson at the bottom Cheapside and made his home in Somerset Place. Of course he continued to create music as well as sell it and was organist first at St John’s (Gt Horton) and between 1856 and 1866 at Horton Lane Chapel. He succeeded his business partner, Mr Winn, as conductor of the male voice Choral Union and was appointed the first conductor of the Bradford Festival Choral Society in 1856. His training of hundreds of voices and development of the knowledge of love of choral singing led to the society earning its position as one of the best bodies of choralists in the country. In 1858, the Bradford Festival Choral Society travelled to London to perform by command before Queen Victoria at Buckingham Palace, and at the close her Majesty asked that Mr Jackson might be presented to her,—a rare honour for a miller’s lad. By this time the family had grown even further, with William born in 1853, Kate Elizabeth	in 1855 and John Henry in 1856. As well as running his business, William Jackson continued to compose music, especially for choirs, and conduct at not only the Bradford Triennial Music Festivals in 1856 and 1859 but also the subscription concerts in St George’s Hall – including one in which the pianoforte player was Charles Halle (founder of the Halle Orchestra only a couple of years later). He continued to father children too! Another daughter, Caroline was born in 1863 and James Hutchinson Jackson was only 2 months old when his father suddenly died at his home in Ashgrove on 15 April 1866. Bradford Festival Choral Society, shocked by the sudden death of the well-loved chorus master took care of all funeral arrangements on behalf of his bereaved family. There was a public service at Horton Lane Chapel on 20 April 1866, with music from the society including one of William Jackson’s own compositions. 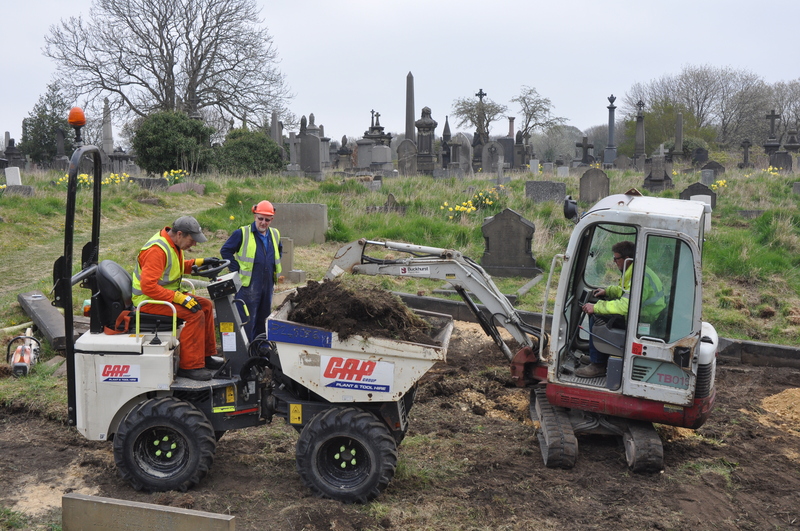 This was followed by a procession to Undercliffe Cemetery led by the gentlemen of the town, with the hearse, mourners and Choral Society following. At the graveside the choir sang a chorale from Mendelssohn’s St Paul Oratorio ‘To Thee oh Lord I yield my Spirit’. The monument we see was paid for by the Choral Society who raised money for this and another in Masham through fundraising performances of Jackson’s oratorio, The Deliverance of Israel from Babylon. William Jackson’s inclusion as a worthy of Bradford is not as a mill owner, philanthropist, architect or wealthy man, but as a man who by his own direct efforts and influence of his example built the musical interest in the town which became a marked feature of Bradford society, and a source of culture, enjoyment and refinement to all classes. The Bradford Observer described him as man of solidity – in his person, his acquirements, his expression. He was essentially a genius, but free from all the vices and blemishes which are supposed to be the natural inheritance of genius. What he set himself to do he did with indomitable perseverance and patience; and he was never satisfied till he had fully acquired what he aimed at. The consequence was he was one of the best men in the town, walking unscathed through the great temptations he was exposed to by the nature of his engagements and associations. By this example he raised the standard of morals in the musical profession of the neighbourhood. John Henry	b 1856 – d 1934. John Henry became a GP in Horwich, Lancs. Married Juliet Claudine Owen daughter of John Owen who worked on the Stock Exchange. In 1911 they lived at Masham House, 29, Victoria Rd, Horwich and JH was a surgeon. Their son, John Owen Jackson became a tea buyer and travelled extensively to the tea plantations in India, China, Indonesia etc.